In continuation with our patient highlight of the month, the team at Theta would like to highlight Susie for August. Susie is a marathon runner who came to us to get treatment for her Morton’s Neuroma pain. We’ve worked with her to stop the pain and help her conintue her successful running career. Susie was kind enough to share both a written and video testimonial describing her treatment journey. You can view the video here, or keep reading to see what she had to say. My name is Susie M. and I am an experienced distance runner and marathon coach. 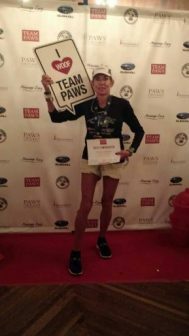 During the beginning of 2017 and while training for the Boston Marathon to be held in April of that year, I experienced a vague yet nagging pain around the third toe in my left foot. This pain seemed to be between the third and fourth toe and sometimes it also felt as though it was between the second and third. Oftentimes I would stop during my run and stretch that foot, only to be plagued with the same dull ache upon running again. By March of 2017, I had tried toe separators, tapes, splints, cutting holes in the tops of my shoes and various other methods to alleviate this disturbing foot pain that was both getting worse and becoming intolerable. I found it nearly impossible to walk barefooted during this time and the pain became a constant problem. I did visit a local podiatrist who suggested some fairly extreme surgery AND that I stop running. This doctor also diagnosed me with a Morton’s Neuroma and proceeded to shave a bone spur off of my third toe, two weeks before the Boston race. Sadly I was prescribed Levaquin to ward off infection and found upon taking the first pill that I was allergic to this medicine. Fast forward to the week before Boston. My foot was healing and I was increasingly concerned that removing the bone spur had not cured the toe pain. This belief was sadly confirmed upon trying to run on the Thursday before the Boston event. I hurriedly went through my stock of various inserts and found that one particular arch support actually did help the Morton’s Neuroma pain. I started snipping and gluing pieces from other inserts onto the one that made the foot feel better and found that by placing a silver dollar sized wedge at the very front of my instep, things were much better. After this finding, I started an online search for a finished product that I could use the following Monday at the Boston Marathon. Happily and very fortunately, I came across Theta Orthotics and Dr. Brent Jarrett on the Friday before I was to fly out to Boston. The Theta Orthotics website, thetaorthotics.com, mentioned a very advanced and much better engineered version of what I was looking at with my DIY version. I took a chance and called the number on the site, hoping beyond hope that somebody could overnight ship me a pair of orthotics to the Marriott in Copley Square, Boston. That part was not to be BUT I was greeted on the phone by a very kind, knowledgeable and informative, Dr. Brent Jarrett. He seemed intrigued with my journey and told me a bit about his own with Theta Orthotics. He went on to talk me through building something much better than what I currently was using and it is this orthotic that I took with me to Boston. I only made it to mile 12 in that race but can tell you that without his help, I would not have made it past that first steep downhill at the very start, out in Hopkinton, MA. Upon returning from Boston, I contacted Dr. Jarrett again and purchased custom orthotics. He promptly mailed the biofoam mold and once he received that back from me, was able to quickly produce and mail my new custom orthotics. Today I am happily training for the 2018 Chicago Marathon in October and can wholeheartedly say that my foot pain is GONE. I continue to wear his orthotics ALWAYS and although I am not out dancing around barefooted, I am happy to again be a runner with zero foot pain while wearing these orthotics. I plan to always wear his orthotics in my shoes, all of them, and feel 100% confident that my Morton’s Neuroma pain will not return. If you’ve used Theta’s products and are interested in being a featured patient on our blog, please email me at bajarrett@gmail.com.